What was life like for children of political activists during the Troubles? 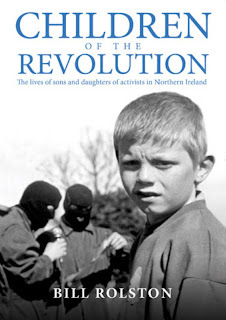 A new book by Bill Rolston and published by Guildhall Press during the summer has collected together the stories of twenty Children of the Revolution whose parents’ activities – and in may cases, imprisonment – had a significant affect on childhoods and life choices. For me, this summer’s reading has been dominated by people telling their stories. Evangelical Journeys collated together ninety five interviews with evangelicals and ex-evangelicals into a fascinating account of their spiritual journeys and an honest insight into the complexity of faith and practice. A few weeks ago, Irish Peace Centres published their report into LGBT Communities’ Experiences of Faith and Church in Northern Ireland. Again this was interview based, and used the personal stories of twenty three people as a powerful way of clearing away the sanitising barrier of academic language and painting a picture of how real people say they experience the world around them. It’s very possible to have lived in Northern Ireland for thirty or forty years and not really grasped the full gamut and heard the stories of what went on in other neighbourhoods and communities. In the introduction to Children of the Revolution, author Bill Rolston explains that while some ex-prisoners, army and police personnel have to greater or lesser extent publicly told their stories, other voices have been inaudible. Towards the bottom of the narrative ladder is the story of children and the conflict, and within that, the direct voice of the children of combatants has barely been heard at all. Rolston’s interviews were conducted right across the political and paramilitary spectrum. There are many insights from the eyes of the children. John Lyttle remembers his father Tommy (West Belfast UDA Brigadier) kneeling at the end of the bed for hours each night, “negotiating” rather than praying. As a child he doodled “blood and guts and helicopters and bombs” while his “father and his friends would be at the Formica breakfast table in the kitchen, chatting about who needed to be killed”. Living with terror in the house and the consequent threat on his own personal security left John feeling that as children “we were being offered up”. Every day of my childhood, and I do mean every day, from the age of about nine until I left at eighteen, I expected to die. I thought about death every day. Getting on the bus, it’s going to blow up. Walking past Unity Flats, is a sniper going to take me out? Dan McCann was in the IRA and shot along with two fellow volunteers by a British Army undercover squad in Gibraltar. His daughter expresses a disconnectedness to her father: “… although he’s just a parent to me, to the outside world he’s something different”. She questions her father’s selfish motivations. You could have changed society forever, but no – for a point, for a one-off, for an event! … To me, it’s a simple choice. For God’s sake, sit down, look at your situation and make a choice that actually benefits your whole family in the long run. Don’t make one that suits you at the time you made it and then not alter it for the rest of your life, which turned out to be very short. There’s 1,001 things you could have done, but no, you had to choose the most risky. She talks about the normality of Gerry Adams visiting the house, and the inappropriateness of other people commemorating her father’s death with impersonal, bloodthirsty hoopla. We slag my ma. We say, ‘If you were doing that now, you’d be up on child neglect.’ … I remember looking at a photo of her and she was six stone. The anguish that she must have felt about what the two boys were being put through in jail. That would have been enough to drive a lot of mothers to drink or other unhealthy coping strategies … I would say, alongside all that anguish, she enjoyed the activism as well. If I’d been living through the times my mammy was, would I have done what she did? Probably. Many of the interviewees describe regular and at times brutal police raids on their homes. "I can remember the peelers hitting the house all the time, looking for guns. We got tortured because of him. [My ma] took the beatings, she took everything else." "I would have been about four or five. And I remember Brits coming into the house, doing raids. They’re not horrific memories; I don’t think that they have traumatised me in any way. I don’t remember being scared. To be honest with you I remember being really excited. It was an event to fill an hour in the day, sort of thing." "One of my earliest memories is getting raided and getting lifted out of bed at three o’clock , four o’clock in the morning. I must have been about three or four and there was a Brit in the room behind my mummy and then the house just getting tore apart." Sometimes terror visited their homes too. Fiona Bunting recalls the night her parents were shot. She talks in the book about coming out of her bedroom and seeing her mum “lying in a big pool of blood” and having to step over her dead father to get down the stairs. Gearóid Adams (son of Gerry Adams) says that his relationship with his father started at the age of five when his father got out of jail. He recalls an uncle coming into school during his P6 year. “Paddy gave me this comical story to try and put me at ease that the Adamses were hard men, and then he told me that my da was shot but that he was okay.” He met up with his mother in hospital. A fracas ensued as police prevented the family from getting to the father’s bedside. All awhile Eamonn Mallie waited to do an interview. Normal life? Gearóid Adams wasn’t alone in the book complaining about being known as someone’s son or someone’s daughter, rather than being accepted for themselves by their parents’ comrades. Children also describe unglamorous trips to prison, sometimes involving long and expensive travel, and often with more sense of duty love. Some talk about their own imprisonment, one even ending up sharing a cell with his father. Stories of children appalled by their parent’s actions. Stories of children who followed their parents into paramilitary activity. Stories of children who are proud of their parents. Stories of children who haven’t yet asked too much about the detail of what parents got up to. We have a generation, two generations, of children who were directly affected by the way and by parents not being there, being away in prison and parents who now can’t come to terms with being out. And lots of parent and their children who can’t talk about how they feel or cope with their feelings, and this affects their relationships now. The book is a warning to parents – even those outside the world of conflict – that their occupations and priorities may have long-lasting effects on their children. And an insight into how a significant group of people in Northern Ireland society resiliently cope with the aftermath of their parents. I’m sure these kind of stories can be told about conflicts throughout history and right around the world. But when it’s on your own doorstep, it’s disturbing. Thanks to Guildhall Press for supplying a review copy of this book. 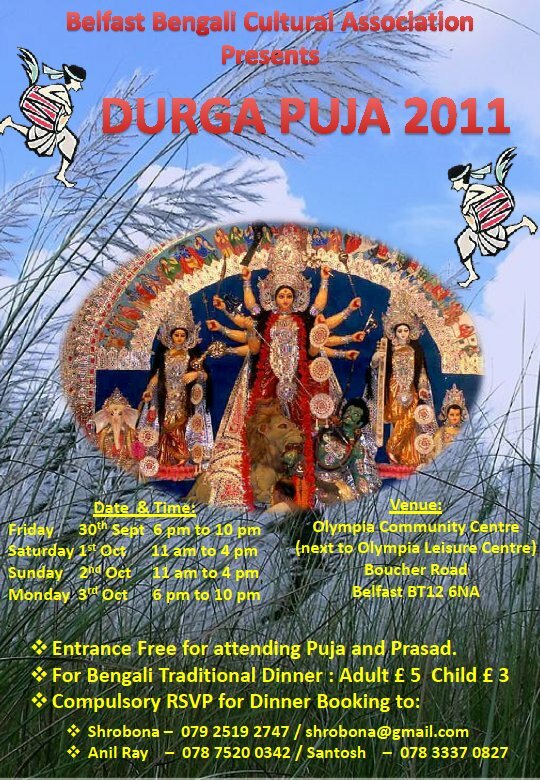 While centenaries are often focussed around big events – beginnings and endings – there are many steps on the journey that will sometimes stick out enough to be remembered. In the run up to the centenary next September of the 1912 signing of the Ulster Covenant, many organisations, publishers and broadcasters will be marking events along the way. 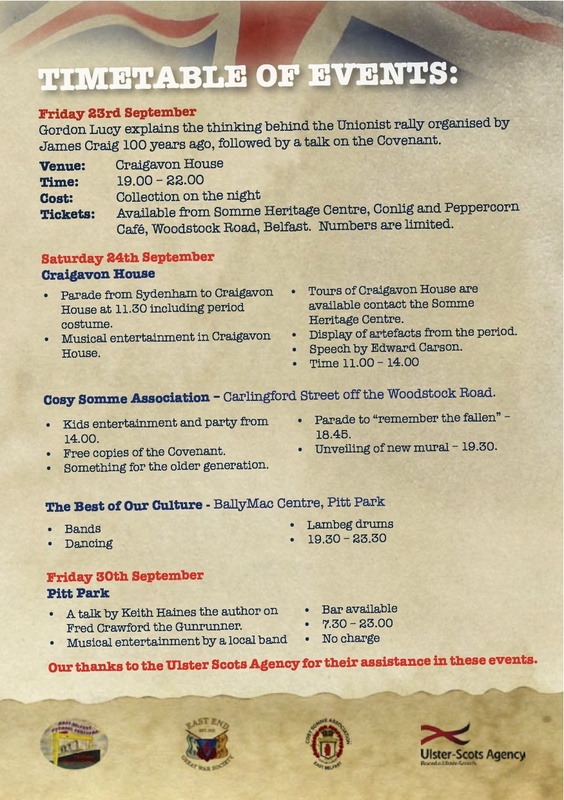 Next weekend, a number of groups are getting together to mark the large demonstration that James Craig organised at his East Belfast home in September 1911 to demonstrate to Edward Carson the level of opposition to Home Rule and to Edward Carson. 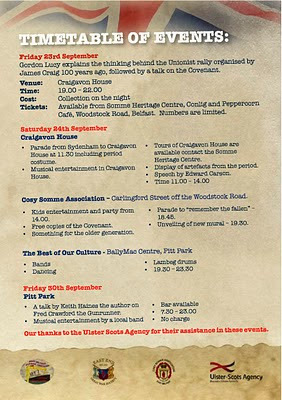 Organised by Pottinger Historical and Cultural Society, East End Great War Society, East Belfast Titanic Festival, Somme Association, Cosy Somme Association. With assistance from Ulster Scots Agency. Expect more events to mark the Titanic, Ulster Covenant, establishment of UVF, Irish Volunteers and Irish Citizen Army, Larne gun-running, start of WW1, Easter Rising, Battle of the Somme, death of Roger Casement, and lots, lots more in months and years to come. Today marks the end of chain of posts and a fascination I've had with the plans to erect a sculpture in the middle of Broadway Roundabout. 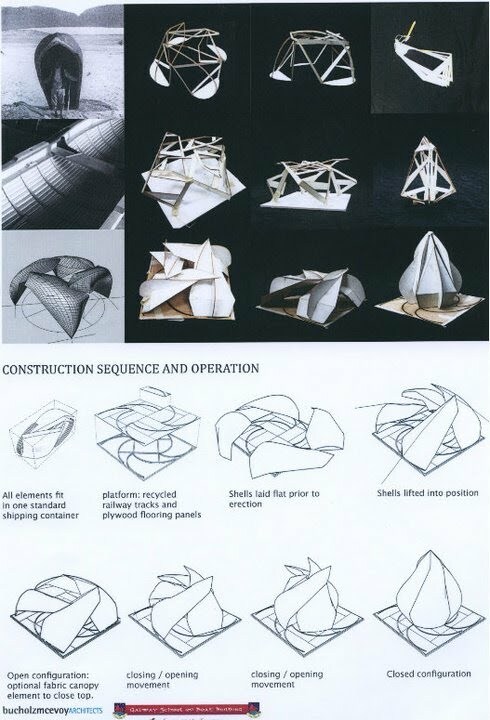 Back in 2007 I mentioned on the blog that as part of the project to create the Westlink underpass, Ed Carpenter had won a public art commission with Trillian - a 45m tall wild flower (representing a post-Troubles city) to be built in the middle of the roundabout. 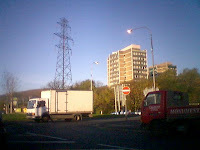 The electricity pylon that used to occupy the overgrown space was removed. 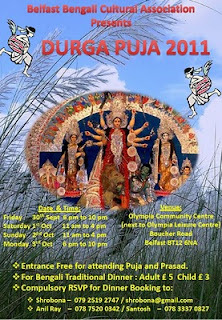 But due to the rising cost of steel, the competition was reopened. Second time around, Wolfgang Buttress won with RISE - his iconic image of two globes resting on a bed of reeds which are fondly referred to locally as the Balls on the Falls, or the Westicles. At lunchtime today, a time capsule was buried under RISE. Less buried, more sunk into the mud. 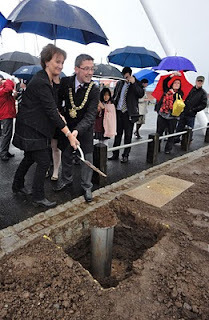 In truly awful weather, Belfast's Lord Mayor Councillor Niall Ó Donnghaile bravely stepped into a dodgy photo opportunity and helped school children from the local area tip earth over the sealed capsule. Having interviewed Wolfgang Buttress at a public meeting last November, I caught up with him again today after the watery ceremony to ask him about his creation. He spoke very warmly about the steel fabricators - M Hasson and Sons Ltd in Rasharkin - who also assembled the sculpture, and he confirmed that they are now working with him on further projects. A success story for local business. Of the £486,000 budget for this piece of public art, 85% was spent in Northern Ireland. Ratepayers will want to know that £56,000 came from Belfast City Council. Taxpayers will want to know that the Department for Social Development contributed £330,000. And lottery players will want to know that the Arts Council of Northern Ireland were able to give £100,000 via Lottery funding. One council official suggested that they should sell snow globes with models of RISE inside in the Welcome Centre! 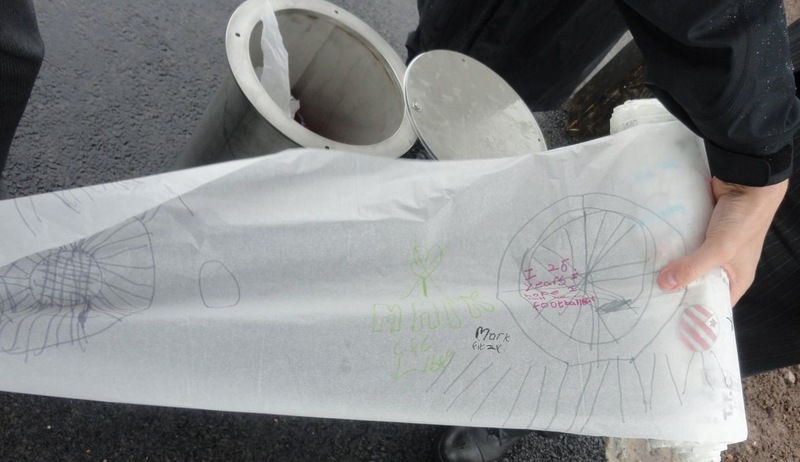 In twenty five years time - if anyone remembers where the capsule was buried - the citizens of Belfast will discover messages from the local children expressing what they hope to be doing in 2036, along with school ties and sweatshirts from the participating schools. They'll marvel at the smell of damp, the way some of the clothing was obviously shoved into the capsule, and wonder why the Belfastians of 2011 didn't roll up the length of greaseproof paper the children had written on a bit more neatly. Future historians will also be able to read the full contents of Wolfgang Buttress' letter inside the capsule in which he describes the pride he felt about the project and learn about the "wonderful people" he met. They may also reflect on his frustrations with "red tape and Kafkaesque rules and regulations". Building a 37.5m tall sculpture weighting the equivalent of six double decker buses in the middle of a cramped busy roundabout was not a bed of roses. Update - the Council have been in touch to explain that the 'contents of the time capsule have to be treated and vacuum sealed before it is finally sealed and buried' - which should give them time to remove any creases from the papers, and refold the school sweatshirts neatly ... and maybe even drop in a DVD copy of timelapse of RISE being constructed! Local independent production company Sixteen South is currently hard at work in a studio in Belfast shooting the children’s show Pajanimals. 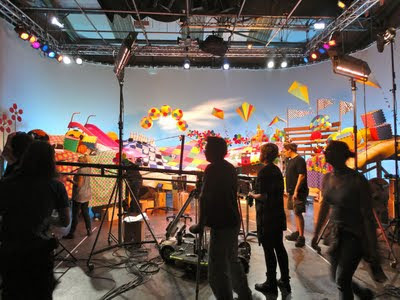 Working in partnership with The Jim Henson Company, puppeteers and crew are cracking through the filming of two 11 minute shows a week which will start to be transmitted into 50 million US homes by Sprout (a 24 hour pre-school cable channel) in early October 2011. 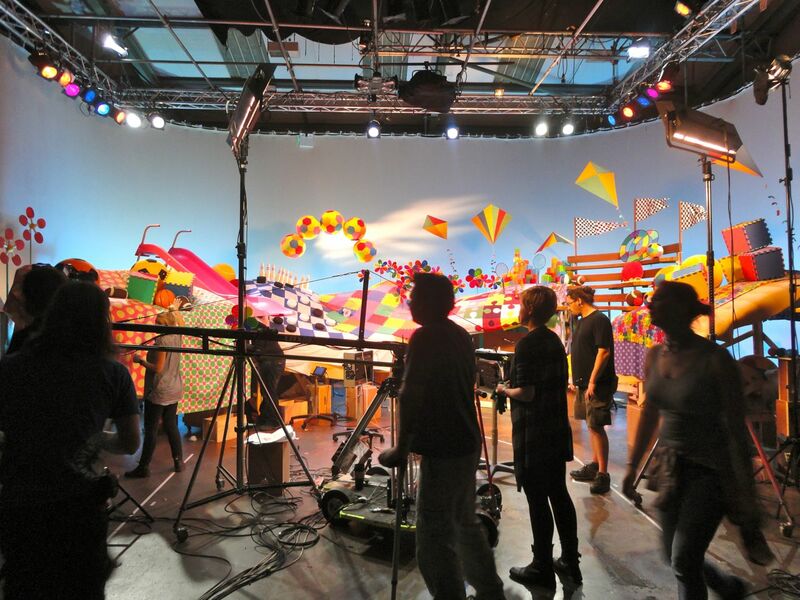 The cast and crew halted work on Monday afternoon for fifteen minutes to watch the company’s previous production – the third series of Big and Small – première on BBC CBeebies. Recently ranked at number 53 in Televisual magazine’s top 100 chart of Indie Producers, Sixteen South has made a mark in children’s programming in recent years: working with Sesame Workshop to make two series of Sesame Tree (and giving me the opportunity to meet and interview Oscar the Grouch and his puppeteer Caroll Spinney) and filming Big City Park in Belfast’s Ormeau Park. Walking into the studio late Tuesday afternoon, I was amazed to see that the set was built so high off the ground. As you pass through the black curtain, you come across a puppet-sized bedroom, cloakroom and even a slide raised up at eye level. The puppeteers stand, holding the puppets at shoulder height or above to keep human heads out of shot of the camera. The current show, Pajanimals has a cast of four: Sweetpea Sue the pony, the excitable duck Squacky, the creative cow CowBella and the optimistic puppy Apollo. The show’s producer Colin Williams explained the background to Pajanimals. [Colin] A number of years ago the Henson Company made a series of eleven short music videos – interstitials [clips played between other programmes] – which were designed to help kids get to sleep. So based on the success of that and the online following … that spurred on a series. We’ve extended their world of the bedroom into an outside and created eleven of these dreamlands which you can see today. This is the land of play. It’s a fun place where the Pajanimals go. The puppeteers don’t just act, but also provide the voices, and even get to sing the songs – three or more per episode – in harmony! It’s very much a musical show in that each eleven minute show has an opening song, a lullaby to close with and two songs within it. So because it’s very much a musical show we’re really focussed on good quality music. They’re great songs and our four leads sing them. We brought in a musical director to write proper four part harmonies. While the programmes they produce will be aired in the US, it’s being made with local Northern Ireland talent. The crew are pretty much all local. We’ve had to hire the best puppeteers that we can find and people who can perform and great at characterisation and also great at singing. So two of the puppeteers are Henson puppeteers from LA and two are local. Local puppeteers from Sesame Tree – Paul Currie (Potto) and Sarah Lyle (a Weatherberry and Samson the bookworm in the second series) – are back working together on Pajanimals. Sarah has graduated to play one of the main four characters, CowBella. She described a typical episode. [Sarah] An episode will open with the four characters in an activity or a game or having fun or reflecting on something they’ve just done. And then it’ll be time for bed, but one of them will have an issue or something that they need to clear in their head. They may be scared, or angry, or mad, or something like that. They’ll try to help each other. They’ll get on one of their beds and go to a land, like the ‘land of play’ or the ‘land of hush’ or the ‘big friendly forest’ and they’ll meet a character there who will help them sort out their problems. And then they’ll travel home and sleep safe and sound. When I arrived the cast were dancing around in a tight circle with the puppets miming to a pre-recorded song. Assistants helped steer the lead puppeteers and work extra arms. After a minute of action, they’d stop, go back to their starting positions and then do their merry dance again to get the next camera angle. [Sarah] There’s four main puppeteers and then you’ll have the dreamland character and you sometimes have an assist[ant] with you. So altogether there you had ten puppeteers in a tiny four by six foot space. Geri Halliwell things! I’m only five foot one and a half. Everyone else is five foot six and above. 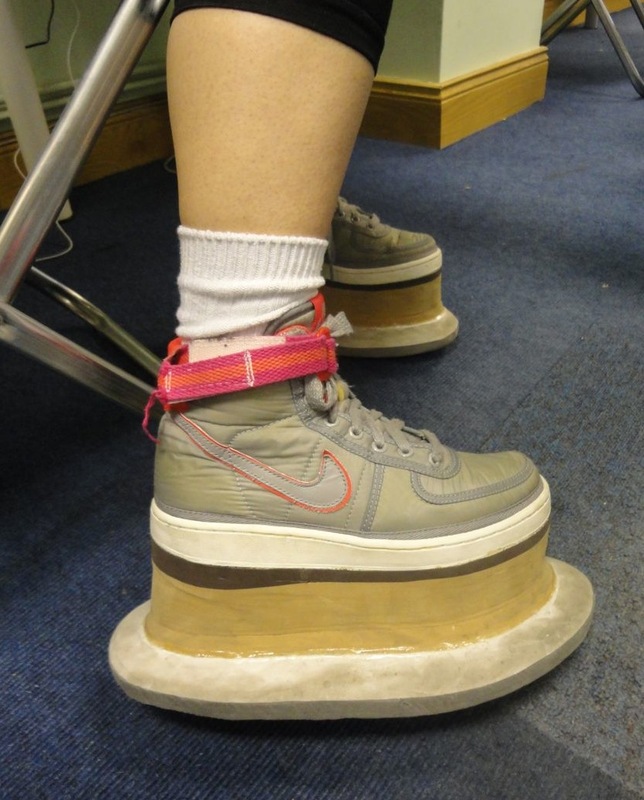 So to save me having to walk on boxes and them having to walk around boxes, I’ve got a pair of baseball boots with about a five or six inch platform on them. Sixteen South is unique in Northern Ireland. As an independent producer, Colin explained that they’ve been pitching, writing and producing children’s programmes for the last three years or so, bringing work to Belfast and training up local talent. [Colin] We’re the only company who specialise in children’s TV in this part of the world. It was born out of a passion … We worked commercially for the last nine years and made lots of commercials and promos but wanted a bigger challenge and wanted to create great shows for kids because we thought we could contribute to that industry. It’s been a short three and a half year journey, but we’ve done a lot in that time. And we’re having a ball. We love it and it really is our passion. Once in the studio, the passion was obvious. It felt like a big family with fifteen or more people in front of and behind the camera. Lots of banter in-between the filming of each sequence. [Sarah] I suppose you never think wee Belfast will get opportunities like that. It’s really good for it to be on my doorstep. Twenty minutes in a car and I’m here working on a job of this scale. So yes, it’s great … Getting to do the songs and the choreography and working along with the American puppeteers who are just so experienced and getting to learn from them. It’s so hard to pick out a highlight. Every day is just so brilliant to be coming to do this every day. Filming a programme for the US in a Belfast warehouse with the rain beating down on the roof, Colin ruefully commented “we’re a long way from LA – eight hours of time difference if nothing else”. Despite the puppets and youthful set, it’s a sophisticated production, with a tapeless workflow, capturing the video and sound to hard drive, editing it, and uploading the completed programmes to Sprout’s servers in the US without ever being dumped onto physical media. … we’re pitching two of our own two properties [programme formats] and they’re two things we’re really excited about. It’s stuff we’ve developed ourselves, so we’re keen to get those off the ground. What about the future for Sixteen South? [Colin] The three year plan is that we’d like to make a feature. Childrens or tweens. Whether it’s puppet based or live action, not quite sure about that. But that’s the medium term plan. But we love puppetry because it’s so tactile and the performances are super. One of the new shows we’ve created is an animation show, so it’s a slight departure from puppetry but the second one is a puppet show. Having recently finished editing and delivered the first set of Pajanimals episodes to Sprout, the team were relieved to hear this afternoon that the first one episode had passed their stringent quality checks. One down, fifty one to go. It’s the stuff of dreams ... sweet dreams. My thanks to Colin, Julie, Sarah and Sarah for making the set visit possible. UTV were on set yesterday too and filed the following report in which you can see the characters and cast in action. 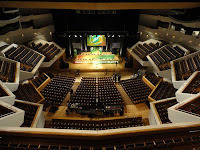 As an experiment I set up a camera to timelapse the main Waterfront Hall auditorium to see how attendance varied across Saturday's business at Sinn Féin's ard fheis (party conference). If I'd thought about it for longer, I might have realised that the vantage point the photo to the top right was taken from would have been better! You can catch some photos from the conference on Flickr. There are posts on Slugger O'Toole covering Friday night (including speeches by Martin McGuinness and Rev David Latimer, and the impromptu press conference afterwards) along with some colour from Saturday (including interviews/audioboos with some stall holders, Barry McElduff's comedy routine, and Gerry Adams' closing speech) as well as a final set of thoughts rounding up the weekend. Irish Peace Centres launched their report into LGBT Communities’ Experiences of Faith and Church in Northern Ireland on Wednesday afternoon. Coordinated by IPC’s Pádraig Ó Tuama, researchers Dr Claire Mitchell (co-author of the book Evangelical Journeys I posted about recently) and Dr Gail McConnell had recruited 23 participants and listened to their stories and perspectives about faith and church in Northern Ireland. Personal stories are a powerful way of clearing away the sanitising barrier of academic language and painting a picture of how real people say they experience the world around them. The stories that Claire and Gail listened to were sometimes surprisingly hopeful and encouraging, yet often predictably demoralising and discouraging. The report sets out the social, religious and legal context in which LGBT people live, and then discusses the participants' experiences under a number of themes. Irish Peace Centres examine the relationship between faith, conflict and peace. Homosexuality is a regular source of confrontation and continues to be a social divide in Northern Ireland. They plan to follow up this report with one looking at the experience of clergy in order “to give voice to narratives from within the religious sector”. Participants in the study spoke about struggles towards self-acceptance, as well as tensions in relationships with family and friends … and often with the ‘gay scene’ as well as churches. Acceptance within churches ranged from “caring and non-judgmental”, through more conditional welcomes (where change was expected – perhaps through ex-gay therapy), expectations of accepting the condition of singleness or even “don’t ask don’t tell” approaches (where ministers insist that LGBT worshippers must “keep it low key”, all the way to rejection. I never thought I’d be a member of a church. I’m still in disbelief that that could be. It was like a homecoming, a spiritual experience to be accepted. I was very emotional the first time I came to the church – I felt fear, disbelief, acceptance. The first time I went [...] I couldn’t help it, I burst into tears. Tears just streamed. The hymn we sang was ‘Be still in the presence of the Lord’ and just like that [clicks fingers]. It was a spiritual moment for me and very powerful. It was a homecoming – coming in from the cold after many years. I could be here and not feel like a reject and a very bad person – an evil person. And [now] I’m a member of the church. The stories are powerful and personal and deserve to be read. Former President of the Irish Methodist Conference, Rev David Kerr, responded to the report at yesterday afternoon’s launch. He spoke about minority, pointing out that “in the first 300 years of its life, the Christian Church had flourished as a minority – often a persecuted minority”. Later on he also conjectured whether the church needed to define “a bare minimum of absolutes [in order to] live with diversity”. You can hear the report’s launch and Rev Kerr’s remarks in the audio below. The report featured in a recent post on the Will and Testament blog, and was discussed at length on last weekend's Sunday Sequence. Update - you can also hear the debate as part of Gladys Ganiel's blog post on the subject of the report and the item on Sunday Sequence. 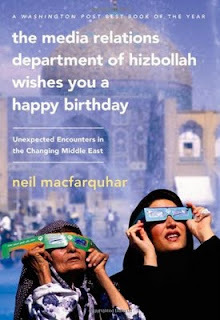 With perhaps the longest title of any book I’ve read this year, The Media Relations Department of Hizbollah Wishes You a Happy Birthday: Unexpected Encounters in the Changing Middle East gives an insight into the lives of people living in Middle East through the eyes of journalist Neil MacFarquhar. MacFarquhar’s father was a chemical engineer who supervised an Esso refinery and a water desalination plant. His family lived on the Libyan coast in Marsa Brega alongside a community of other employees’ families. The first 40 or so pages deal with his childhood in Libya and his encounters with Qadhafi when he returned years later as a journalist. A fluent Arabic speaker, MacFarquhar spent 13 years as a journalist covering the Middle East for Associated Press and New York Times. The book tours around the region looking at different cultural, religious and political thinking: fatwa, jihad, policing and justice. Through the book’s pages, readers meet many people on the ground and hear their aspirations and ideals. It’s an eye-opening read. US Secretaries of State and British Foreign Office Ministers are apt to speak about the need for change in the Middle East using western models and concepts. Yet MacFarquhar introduces readers to people who are keen for change, but articulate it in their own cultural nomenclature. While readers, commenters and posters on Slugger O’Toole sometimes feel the need to do so under a badge of anonymity, their ability to express views (within the bounds of defamation) is taken for granted. Users of Bahrain Online – the “go-to political site” in the island state – have a different starting point. Webmaster Ali Abdulemam explained to MacFarquhar that “freedom of expression is something you have to take, not something that will be granted to you. Royal princes, parliament members, opposition leaders, and just about anybody with an interest in politics told me [MacFarquhar] that they consulted it daily to find out what the opposition was thinking. 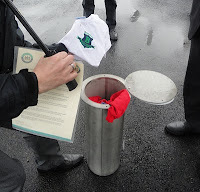 The easiest way to ensure a wide turnout for any demonstration, the leader of the main Shite opposition assured me, was to post it on Bahrain Online. By 2008, Abdulemam said, he was getting some 150,000 hits a day, or more than one-quarter of native population. “If something happens anywhere in Bahrain, usually within five minutes maximum something about it is happening on mu site,” he said. MacFarquhar describes Tash Ma Tash, a cult Saudi satirical comedy that is self-critical of Saudi society and airs new episodes each year exclusively during Ramadan. The show did not try to directly challenge the religious hierarchy, but it did poke fun at some of the more lunatic ways conservative traditions twist daily life in the twenty-first century. The show’s coverage of issues like a woman’s need for a male guardian to accompany her outdoors sparked debate and a change in law. The modern tragedy in Saudi Arabia and elsewhere is that the rulers keep such discussions bottled up in the private sphere – the Internet is not yet widely accessible enough in most countries – and in that restricted environment problems tend to fester rather than slouch toward resolution. There’s an illuminating discussion about fatwas and the concept of fatwa shopping. It’s not all about death sentences. Religious scholars issue fatwas on questions ranging from household quandaries to major issues of public policy. So from whether a Muslim woman should ride a bicycle (“usually not, too publicly physical”) to whether a man should wear soccer shorts (“only if they modestly come below his knees even when he sits down”) to whether the Saudi royal family could “allow 500,000 infidel American soldiers to deploy in the kingdom after Saddam Hussein invaded Kuwait in August 1990”. … fishing around for a religious scholar who will endorse whatever the supplicant wants. That elasticity on any topic large or small underscores both the benefit and the bane of Islam having no formal ruling structure. As well as the serious business of reforming governments and changing culture there are some hilarious stories. Chapter five covers MacFarquhar’s mad-cap attempt to use three ovens spread across Jerusalem to cook Thanksgiving dinner for some international friends. It took all afternoon and a cab driver to baste and cook the various dishes … all because the door fell off his own oven. MacFarquhar points out patterns of government belief and behaviour across the area. … the repressive regimes ruling the Arab world … believe they can find the magic balance required to maintain their grip on power while introducing just enough openness to east the simmering frustration of the next generation. At the end of the book, MacFarquhar reflects on 9/11 and the American government’s confrontational approach demanding changes to the curriculum “saying that the religious content helped breed foot soldiers for Al-Qaeda”. Instead of being an effective lobby to open up educational opportunities for all, the US demands “brewed all manner of resentment” and “smacked of Christianity attacking Islam, of the entire Crusades resurrected”. Instead, MacFarquhar counsels that the American government should find ways to raise the kind of questions that parents in the region ask. “Why are the Arabs, who once kept science alive, now so weak at it? … How come the wealthy Gulf countries have failed to produce any Arab Microsofts, any Arab Apple Computers, any real modern innovation of any sort? He also suggests that Washington “should be more vocal in supporting change, no matter how weak its proponents are and whether or not their goals mirror American policy”. The very fact that the US notices any measure of change “signals that it is watching” and helps agitators “immeasurably”. The west sees democracy as the missing ingredient in the Middle East melting point. But reformists that MacFarquhar met, and introduces his readers to, have other reforms higher up their list. The attempt to establish any kind of progressive organization to guide the process [of altering the political landscape] is illegal in virtually every country in the Middle East. Both free speech and the right to assemble are sharply curbed. Merely gathering in the same place to talk about how to achieve change can provoke arrest and sometimes a harsh prison sentence. For many reformists, both in Saudi and elsewhere, the lack of such simple freedoms grates most; obtaining basic civil rights constitutes a far higher priority than elections or other formal ingredients of Western democracy. Later in the book, MacFarquhar returns to the freedoms people across the region have spoken to him about. All of them would certainly prefer to live in open societies; to enjoy freedom of expression; freedom from fear of their governments and their wicked secret police; freedom from the vagaries of an unpredictable justice system; freedom to assemble and to form the kind of civic organisations they want; and yes, freedom to choose their own leaders … Political freedom may be stuck in line behind the desire to live a life without hunger, to attain some manner of security. At a time when civil protests, political revolution and guerrilla military action are in the news, Neil MacFarquhar’s riveting book paints a believable and fascinating picture of the Middle East, and is a timely and recommended read. Tickets are still available for Tuesday night’s Literary Belfast celebration at 8pm in the Ulster Hall. Poetry, plays and prose from the pens for Belfast writers such as Colin Bateman, Ciaran Carson, Patricia Craig, Leontia Flynn, Marie Jones, Michael Longley, Martin Lynch, Bernard MacLaverty, Owen McCafferty, Sinead Morrissey, Frank Ormsby, David Park, Glenn Patterson and Paul Muldoon. Cost £5. Literary Belfast is a new tourism initiative “to promote the rich literary heritage and vibrant contemporary scene”. Northern Ireland Tourist Board’s Tourism Innovation Fund has been tapped to capitalise on the “massive” literary tourism market. "The United Kingdom currently features as number one in a list, compiled by TripAdvisor, of the top ten literary destinations in the world, and literary tourism contributes up to £2.6 billion a year to the British economy." As well as putting 14 local wordsmiths on the same stage, the evening will also launch a number of other literary resources. new and enhanced literary tours and trails including the ‘Belfast Literary Walking Tours’ (by Robbie Meredith and Hugh Odling-Smee), the ‘CS Lewis Tour’ (by Sandy Smyth) and the ‘Nearly True Tales Tour’ (by Young at Art, for children 7 years and over). Grammar school intake - hoovering up pupils at the expense of local secondary schools? Having posted about and charted the recent GCSE results, my thinking turned to that old chestnut of grammar school intake. While some grammar schools manage to fill their First Form Year 8 places with pupils achieving the top grades/marks in transfer tests, others fill up with local students right the way across the academic spectrum. The Belfast Telegraph normally splash with them in mid-October when they have been collated (ie, FOIed). The 2011 figures aren’t yet available, so the charts below use the Belfast Telegraph-compiled figures for the NI grammar school intake in 2010. I’m just using a subset of the grammar schools, mostly ones in Bangor, Belfast, Coleraine, Derry and Lisburn. The chart below shows the number of pupils taken into Year 8 in September 2010 as well as the range of marks for those pupils. AQE test schools are at the top, and GL Assessment at the bottom. Note that AQE and GL Assessment results aren’t simple marks out of 100, and aren’t directly comparable across the different systems. Some schools like Dalriada in Ballymoney took in pupils within a tight range of high marks. Others like Foyle & Londonderry College and St Mary’s Christian Brothers’ Grammar in Belfast accept students into Year 8 across a very wide range of marks. The range of intake is even more obvious when you look at the proportion of each grade that the schools accept. The 2010 AQE results published by the Belfast Telegraph were broken down into five quintiles: Q1–Q5. GL Assessment results were graded A, B1, B2, C1, C2 and D – but each grade doesn’t represent a fixed percentage. Note: (1) comparing AQE and GL Assessments results is a bit like comparing apples and oranges; (2) many schools also accepted a number of pupils without test results, or reserved a proportion of their intake for pupils meeting non-transfer based criteria (these are categorised as ‘Other’ in the chart below). Given that the normal perception is that grammar schools pick up the most academically able children, I’ve over-simplistically used Quintiles 1 and 2 (AQE) along with Grade A results (GL Assessments) as the ‘top grades’ and shown them on the right hand side of the vertical axis in the chart below, and then mapped the remaining quintiles and grades in descending order on the left hand side. What the chart above shows is that relatively few grammar schools completely filled up with children who achieved the top GL Assessment grade or where in the top two quintiles of the AQE exam. Lumen Christi College and Rathmore Grammar were the two notable exceptions in the areas I sampled, both oversubscribed with pupils achieving the top grade. 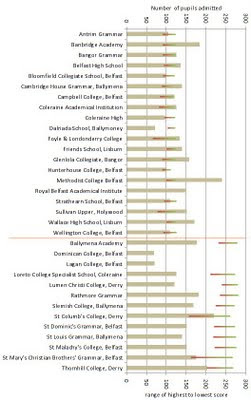 Schools like Ballymena Academy, Methodist College, Friends School, Sullivan Upper and Wallace High School were close to only accepting in pupils with A grades or in the top two quintiles (ie, the top 40% of AQE entrants). 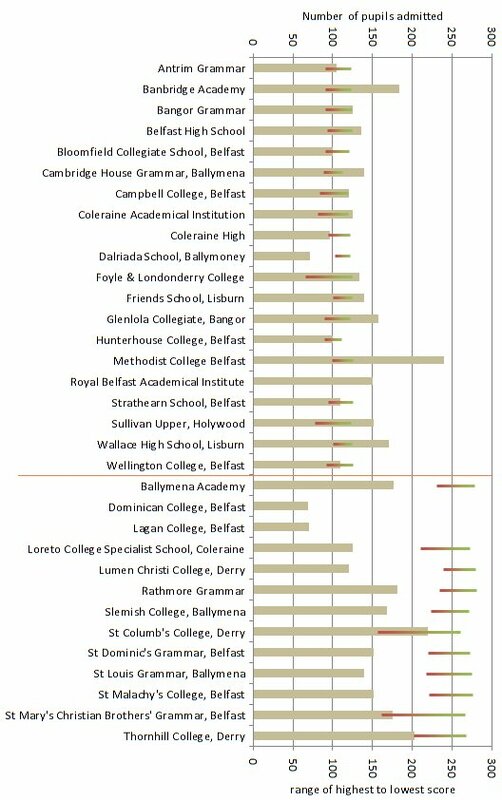 However, grammar schools like Cambridge House, Campbell College, Coleraine Academical Institute and Hunterhouse College were mostly accepting in students in the bottom three quintiles (ie, lower 60%) of AQE intake. If the Department of Education’s Every School a Good School policy is truly bedding in and creating educationally rich opportunities right across the range of schools and colleges in Northern Ireland, is it fair that some grammar schools are filling up their classrooms to offer a predominantly academic curriculum to students who could have benefited more from a wider range of academic and vocational learning offered by local secondary schools. What is it that gives grammar schools their magnetic appeal and kudos? Is their academic promise at least partially illusory? Where's the system's desire to build the self esteem of pupils instead of just crudely applying academic pressure? The grammar school lure helps to empty local secondary schools of pupils who they were set up to serve well and help thrive. And in turn that destabilises secondary school funding and creates a downward spiral of results, reputation, and intake. Yet while secondary schools are disadvantaged by their not-so-elitist-after-all grammar school neighbours, few grammar schools seem to have any problem filling their places and avoiding the application of any kind of minimum entry criteria. 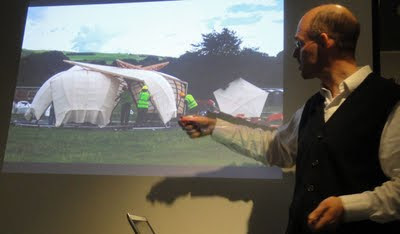 Five small upside-down boats – currachs – leaning on each other with wool stretched over their hulls instead of traditional tar, creating a sheltered exhibition pavilion and performance space that can hold around 40 people. All mounted on a system of curved rails so that the currachs can twist round and close up tight like a clamshell to protect the venue at night. And designed to fit into a container on the back of a lorry for easy transportation to the next venue. Throughout history skilled craftspeople have worked closely with architects to create landmark buildings encapsulating exquisite design and attention to detail, and the competition is aimed at reinforcing this link. They won the competition, and their creation has been screwed together for the first time at the Electric Picnic festival which is running this weekend. Their pavilion will host craft exhibits, music and talks during the festival before being dismantled and shipped to Open House Dublin 2011 in October. 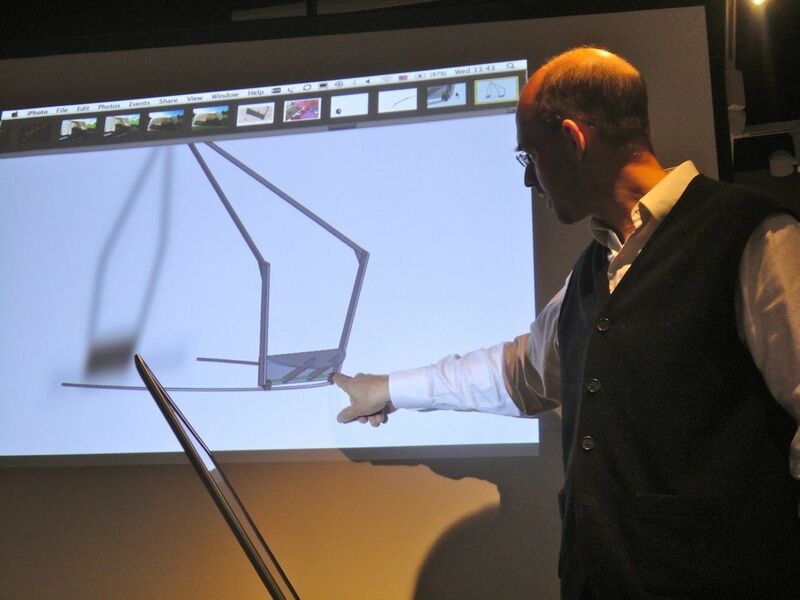 It was interesting to understand how the very precise 3D modelling of the architecture practice worked alongside the cruder practice of boat building. Bending oak in a steam chamber is much more rough and ready than the millimetre perfect geometric design. The five currachs (up from four in the original competition pitch) were incredibly fast to build (each took around three days) and yet were light, strong and relatively inexpensive. Merritt commented that the Cork engineers – who supplied the blocks and rails that allow the currachs to smoothly rotate as the venue switches shape – seemed closer to craftsmen than manufacturers as they built ‘single particular devices’ to solve individual problems rather than large end-to-end solutions. Much of modern architecture – at least the results that I see on the streets of Northern Ireland – is about straight lines, right angles, and acres of glass and concrete. But in a fascinating comment during the question and answer session afterwards – not captured on the video – Merritt suggested that ‘we have lost the memory … of how to use timber’. Wood has become decorative and secondary, disguising its incredible strength. 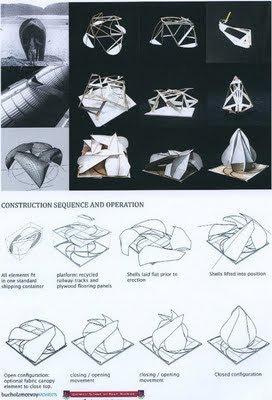 If you’re down at Electric Picnic, check out the Cruth Curach pavilion and let me know what you think.